Life is busier than ever, taking time to sit and visit is rare. This card brings me back to when my kids where content with play dates, had no school to run to and from, sports or activities to hit in a timely manner. 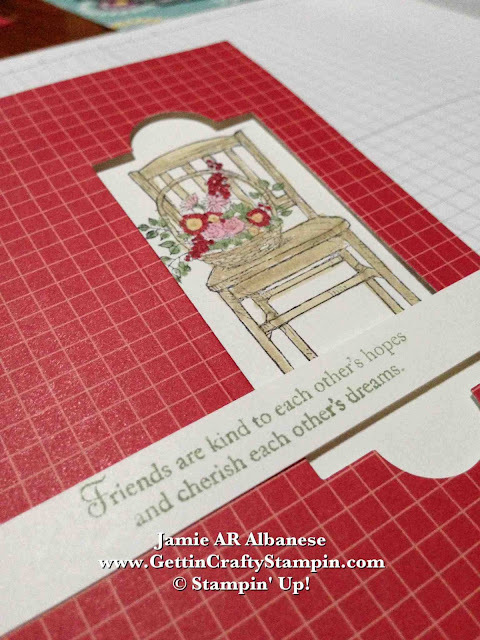 Create a WINDOW card with our fun Storytime* Designer Series Paper(#126907) and this sweet Cherish Friendship* stamp set (#122882) come together to create some great memories! 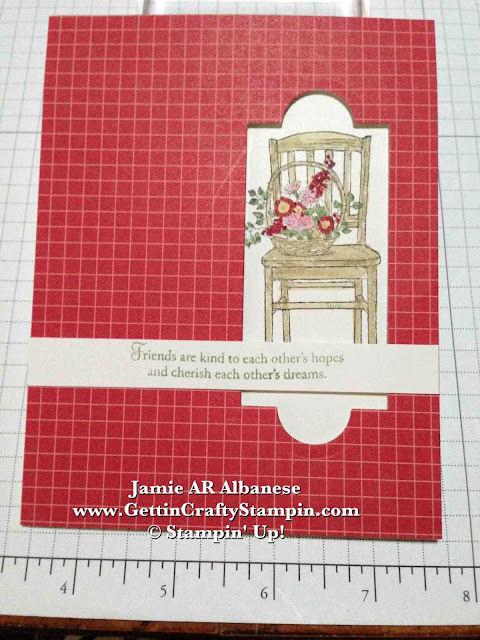 Color in this card with our Stampin' Write Markers! 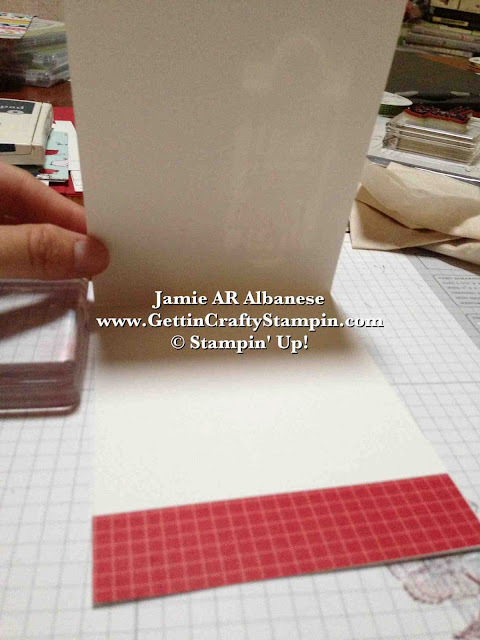 Stamping this in Basic Black ink (#126980) on Whisper White card stock (#100730). Color it in with our Riding Hood Red*, Wild Wasabi, So Saffron and River Rock* Stampin' Write Markers. Frame it up... with the aide of our Apothecary Accents Framelits (#127003) and Big Shot (#113439) and layer it over the stamped and colored image with our Stampin' Dimensional Adhesive (#104430). HERE, here I messed up when stamping my chair... so to 'fix' it... 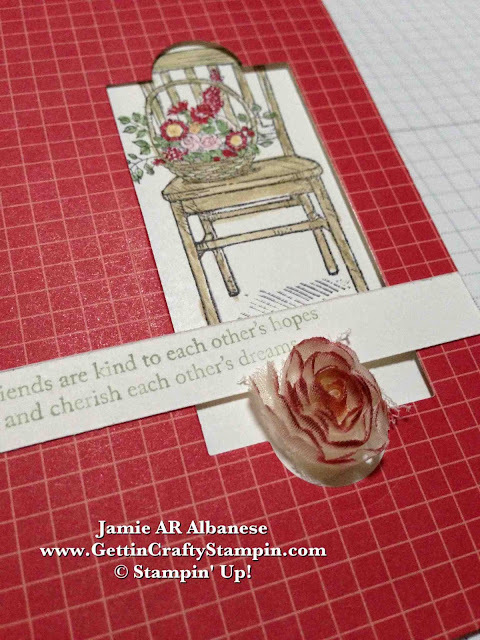 I moved this banded sentiment over the 'open' space and added our Flower Trim (Spring Mini) that I tipped color with our Riding Hood Red* Stampin' Write Markers. BAM -a boo-boo becomes a sweet card! 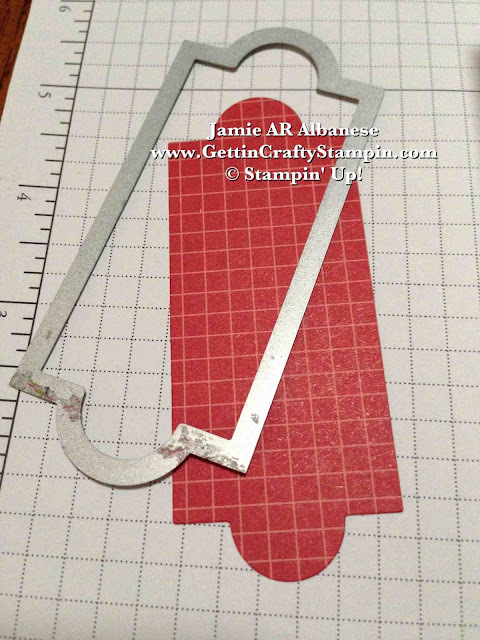 Using my Scraps... using the strips of scrap to tie in the inside is easy and sure to wow. Saying Good-Bye is hard to do! Leaving the comforts of my friends' home (both of my very good friends have moved out of state and our kids are growing quickly...) but memories live on and (some days) keep me going. Say "Hello" to these soon to retire* products!! When you see this ( * ) you know it will be gone by the end of May! See ALL of our Retiring Papers, Colors and Stamps (almost ALL of this card is soon to retire!!) when you CLICK HERE! 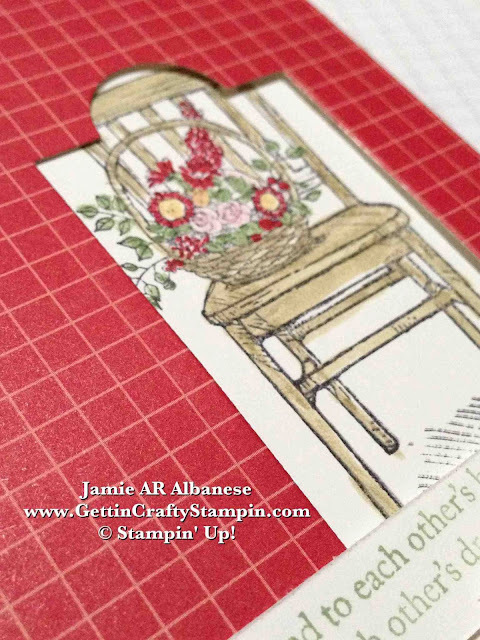 Mixing this sharp patterned paper with a country style stamp? Have fun mixing it up! Leave me a comment and let me know! Share this on G+, Facebook, Pinterest, Twitter, email... and remember that you can follow me on all of those avenues!